Facebook has some of the best Photo Album features like you can rotate the pictures, tag them and etc. But you cannot download the Albums at one go for viewing them later or may be while you are on the move. If you want to have the entire album in your hard drive, then you have to manually go through each photo and save them. This gets pretty tedious if the album has a large number of photos. But this problem can be solved easily if you are using Firefox Browser. There is an addon available called FacePAD (earlier known as the Facebook Photo Album Downloader) which allows you to download your all photos from your friends’ facebook albums with the click of a button. First install the FacePAD addon for Mozilla Firefox and restart your browser. 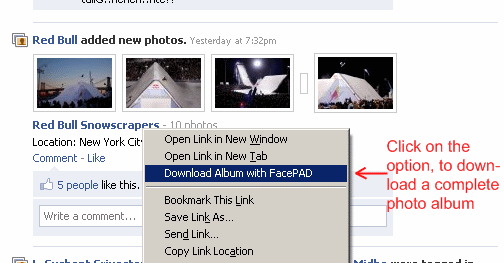 To download photos from the an album, right-click on the name or link of a facebook album and click the Download Album with FacePAD option. A pop-up will appear telling you to wait a moment while it initialises the download process. Press OK and the photos will be downloaded to Firefox’s default download directory. 20 photos are downloaded at once and you will get a popup confirming the download for every 20 photos.